As a matter of fact, in life and in the theosophical movement, all is not easy to understand. One must take into consideration that Sylvia Cranston’s extraordinary biography of Helena Blavatsky  also got published in an independent way in the 1990s, although Sylvia Cranston was a lifelong associate of the United Lodge of Theosophists, whose ideals the Theosophy Co. exists to serve. Jerome Wheeler, the founding editor of “The Aquarian”, clearly foresaw the reasons to publish in an independent way the book in defence of H.P.B. and her teachings. Eight years before the publication of “The Fire and Light”, which exposes the slanders against HPB, Jerome wrote to Carlos Cardoso Aveline and anticipated the need for self-sacrifice and firm determination. The ULT-Day Letters ceased to be published in 2011, two years before “The Fire” appeared. 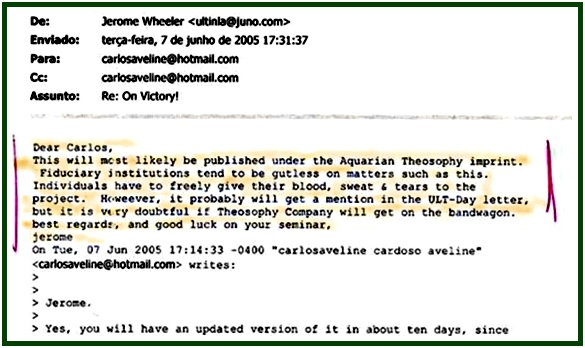 A long-standing theosophist born in August 1935, Jerome Wheeler founded “The Aquarian” in November 2000. In 2005, the journal started the project of a book in defense of HPB. Jerome worked for the project as long as he could, and left the task to other hands – for health reasons – in July 2006. The project was initially devised to publish in paper the Letters of HPB, only leaving aside the infamously false texts fabricated as a way to slander her. Later on, however, it was seen that the volume should be more comprehensive in the way it dealt with the theosophical literature, authentic and false. While a number of authentic Letters from HPB were published online , a much wider defense of the authentic literature was developed for the book in paper. When “The Fire and Light” finally appeared in 2013, its language and style were condemned for “not being diplomatic enough”. The book was said to be too blunt in the way it shows the editorial mistakes of some politically powerful “theosophists” who promote and protect slanders against Helena Blavatsky. According to some friends, it is unkind and unbrotherly to show in public the frauds of those who attack the center of the aura of the theosophical movement with slanders covered in nice and politically correct wording. As no one can forbid theosophists from defending the truth against slanderers, the accusers can only say that “The Fire and Light” is too direct in style. “There should be less frankness in language”, they suggest in careful, indirect language. And although they seem to be wrong, we must examine the issue with an open mind. How neutral and cold-blooded should one’s tone and language be, as one defends Helena Blavatsky from “theosophical” slanders? Is it one’s duty to abstain from saying the truth, in order not to offend disloyal people who happen to be politically influential? It is useful to examine what Robert Crosbie, the main founder of the United Lodge of Theosophist in 1909, had to say about such a question. We sincerely thank our critics. Right or wrong, fair or unjust, criticism helps us verify and evaluate our efforts, as we fulfil our duty. A frank diversity of views strengthens theosophical associations. “The Fire and Light of Theosophical Literature”, Carlos Cardoso Aveline, The Aquarian Theosophist, Portugal, 2013, 255 pages. “HPB – The Extraordinary Life and Influence of Helena Blavatsky, Founder of the Modern Theosophical Movement”, by Sylvia Cranston, 648 pp., G.P. Putnam’s Book, New York, 1994. See for instance, in our associated websites, the two series of documents entitled “Letters Between Blavatsky and Judge” and “The ‘Judge’ Letters of H.P.Blavatsky”. In the article “From the Notebook of an Unpopular Philosopher”, by H.P. Blavatsky. It is available in our associated websites. From the text “In Defense of Criticism”, by H. P. Blavatsky, which can be seen in our websites. “Freedom From Pseudo-Theosophy”, by R. Crosbie. The article is published in our websites.